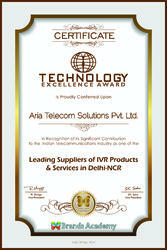 Founded in 2003, “Aria Telecom Solutions (P) Ltd.” has carved a niche throughout India, Africa, Nepal, Bhutan, UK and Bangladesh by offering a world-class range of Stable Software. Our software is precisely designed to run on commercially available PC’s and Voice Processing Cards. In order to meet the specific requirements of our clients, we also define, design, develop and deliver technology enabled PC-Based Voice Processing System Business Solutions. We aim at growing and expanding with our efficient team of professionals. We have adopted advanced technology to improve our functionality. As per our objective of complete client satisfaction, we value our clients by providing an unmatched quality without compromising on quality. We always plan for the diversification in the software to suit the present and future day's requirements of our clients. 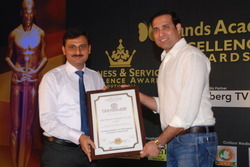 We are rapidly growing under the guidance of our founder, Mr. Ravindra Saini. He follows ethical business practice and visionary approach to expand our business activities in the domestic as well as overseas markets. We are pioneers in offering a wide range of PC-based voice processing systems that are carefully designed using technically improved mechanism. Our team of professionals designs them as per the latest trends in accordance with the varied international quality standards. Owing to their advancement, accurate performance and compatibility, they are capable to fulfill the diversified demands of different sectors such as Call Centers, Corporate, Government, Share Brokers etc. We are reckoned as one of the foremost designer and service provider of innovative software. We provide different customization solutions related to our product line ranging from small scale IVR systems to high end dial out and call testing programs. We feel pleasure by customizing our collection in accordance with the specific telephony requirements. 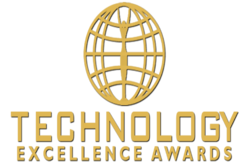 Since our inception, we aim for providing an innovative range of software ranging from small scale voice logger systems to high end dial out and call testing programs. Our motive is to offer efficient and cost-effective solutions to our clients within committed time frame with minimum investment. Our technical staff always feels pleasure by solving the queries of our clients. Our product line support loop-start, ground-start, DID, T1, E1, Signaling 5 (SS#5), Signaling 7 (SS#7), ISDN, and the VoIP Session Initiation Protocol (SIP) and H.232 interfaces. We have integrated our Voice Logger, Voice Mail and Automated Attendant features o that they can operate on any PBX and central office (CO) switches. These software are capable to function with the most efficient voice processing boards. In order to attain complete client satisfaction, we have developed different innovative software in compliance with the defined quality standards. Our product line is customized as per the demands of our clients with 2, 4, or 8 ports. We have also developed software with 24, 30, 60, 96, 120, 240, and 480 ports to suit the requirements of large service providers. These products are availed in the markets at the reasonable prices within stipulated time frame. We have employed a highly experienced and dedicated team of professionals, who have vast industry experience and knowledge in their respective fields. They understand the diversified demands of telecom and strive to bring quality products at the reasonable prices. Our professionals support valued clients during the installation and operation of these products. A good communication channel is maintained by our team of professionals to receive the feedback from our clients. With the help of our technological advancement and quality products, we have been able to garner large clientele across the world. Our creative team of professionals has installed over 7,000 ports of installed software in India and abroad. Apart from these, we have also installed all standard telephone signaling protocols like T1, E1, SS#5, SS7/C7, SIP, H.232 etc. Our advanced software is capable to run on multiple platforms including Microsoft Windows, Linux and Vmware. 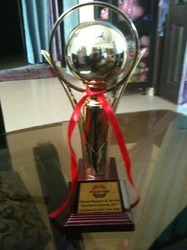 These quality products are catered to numerous countries such as India, Africa, Singapore, Malaysia, Nepal, Bhutan etc. 2010: We launched a, extensive online monitoring tool for voice logger that show the live status of voice logger installed at client different branches at center location without having static /public IP at branch location. If somebody is disconnected from the telephone line even then monitoring show. 2009: We launched Aria CCS-IVR that is compatible with all industry standard voice boards such as Dialogic, Synway & Donjeen etc. 2008: We introduce a Multi-Technology software platform that permit one to use it as predictive dialer, auto campaigner and auto dialer irrespective of media weather TDM or VOIP. 2007: We offer our CCS software product line, which is purely IP based and has three modules. 2005: We introduced our Telephone Voice Recording System that is the best PC based voice logger in the industry. 2004: A TVRS- Telephone Voice Recording System was introduced that is the best PC based voice logger in the industry. 2003: We started our business activities with small telecom products such as embedded voice mail, Embedded Auto attendant, Music On hold and multi media based PC based logger and outsource product. We are by leaps and bounds under the able guidance of Ravindra Saini, who is MD and Chief Executive Officer of our company. He utilizes his vast industry experience and visionary business acumen to provide superior automated customer contact solutions to leading enterprises across many diverse industries. 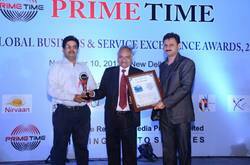 He has association with leading telecom companies like TATA & AVAYA, NORTEL, HCL INFOSYSTEMS, HECL and Matrix Telecom. His strong efforts and dedicated approach has helped us to climb the height of success. 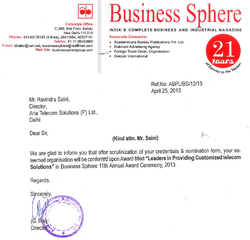 We are a trusted name in the telecom industries by providing specific solutions to our clients. Our solutions are delivered within committed time frame at the affordable prices. We have become synonymous of Voice Logger Industry due to our dedication, innovation and prompt after sale support. We started our business activities with small multimedia based voice logger and improve the features of voice logger. We also provide auto logger, a combination of Voice logger and IVR which automatically answer a call and record it silently specially used for investigating agencies. We have designed an unmatched range of CCS that is compatible with various platforms. We have employed highly experienced technical experts that enable us in developing and managing of shared IVR systems that assist us to acquire complete client satisfaction. We always strive to improve the quality of our products as per the specifications of our clients. Our 7/24/365 attention is on one technology - shared IVR services - and we have found that we can save our clients millions of dollars because we measure automation improvements to the 10th of 1% and are constantly looking for ways to optimize our client's contact center automation. Getting the power from IVR ARIA CCS, we assist numerous companies and government agencies in improving their contact center automation and drive up customer satisfaction levels. Our rich vast industry experience and expertise has helped us to develop performance-oriented software and achieve the total client satisfaction. 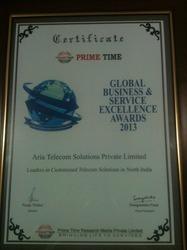 ARIA is dedicated exclusively to the telecom software field. The entire organization is geared to provide quality software products that meet important telecom needs, at cost effective prices. ARIA employees approximately 45 skilled senior software engineers, support staff members, and sales personnel devoted to bring quality products at competitive prices. The knowledgeable technical support team employed by ARIA is available to assist you during installation and the operation of your system.